Site of Confederate batteries on Pamlico River which enabled General D. H. Hill's forces to besiege Washington in spring of 1863. Five miles east. Location. 35° 27.39′ N, 77° 3.508′ W. Marker is near Chocowinity, North Carolina, in Beaufort County. 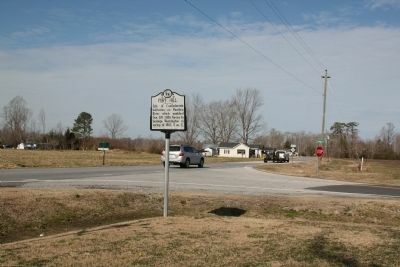 Marker is at the intersection of State Highway 33 and Windmill Road (County Road 1124) on State Highway 33. Touch for map. Marker is in this post office area: Chocowinity NC 27817, United States of America. Touch for directions. Other nearby markers. At least 8 other markers are within 6 miles of this marker, measured as the crow flies. Trinity School (approx. 4½ miles away); Trinity Church (approx. 4.7 miles away); Washington, North Carolina (approx. 5.8 miles away); Siege of Washington (approx. 5.8 miles away); Josephus Daniels (approx. 5.8 miles away); Dr. Susan Dimock (approx. 5.9 miles away); John Gray Blount (approx. 5.9 miles away); DeMille Family (approx. 6 miles away). Touch for a list and map of all markers in Chocowinity. Also see . . . North Carolina Fifty-Second Regiment at Washington, N.C.
More. 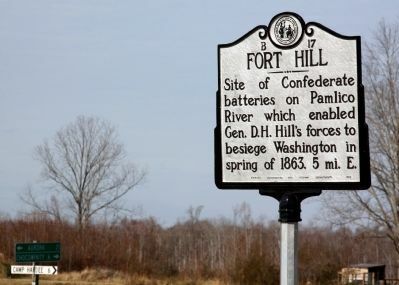 Search the internet for Fort Hill. Credits. This page was last revised on June 16, 2016. This page originally submitted on February 19, 2012, by J. J. Prats of Powell, Ohio. This page has been viewed 508 times since then and 10 times this year. Photos: 1, 2. submitted on February 19, 2012, by J. J. Prats of Powell, Ohio. Editor’s want-list for this marker. Photos of remains of batteries riverside. • Can you help?